If anything, this just goes to show the importance of enunciation. 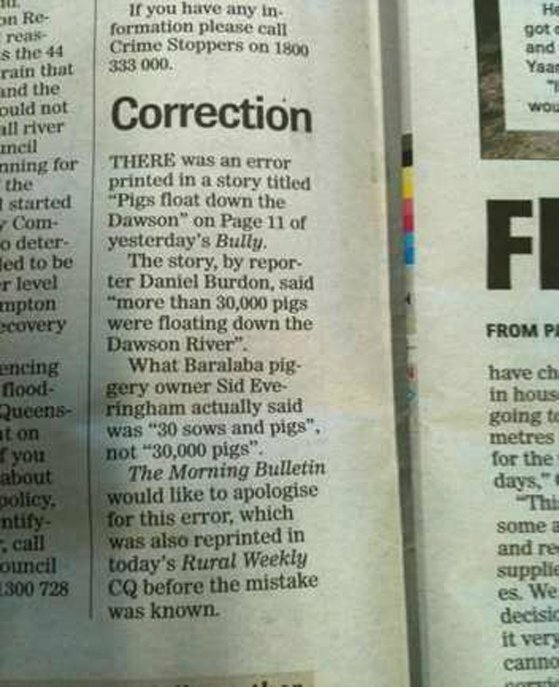 Twitter user HeathC tweeted this hilarious newspaper correction that apologizes for misquoting Baralaba Piggery owner Sid Everingham. He was quoted as saying 30,000 (yes, thirty thousand) pigs were floating down the Dawson river, when he actuallly said that "30 sows and pigs" were floating down the river. "Seems to me like Sid Everingham was having himself a bit of fun."